Engraving on laid paper, trimmed along the image borderline and mounted on grey card. 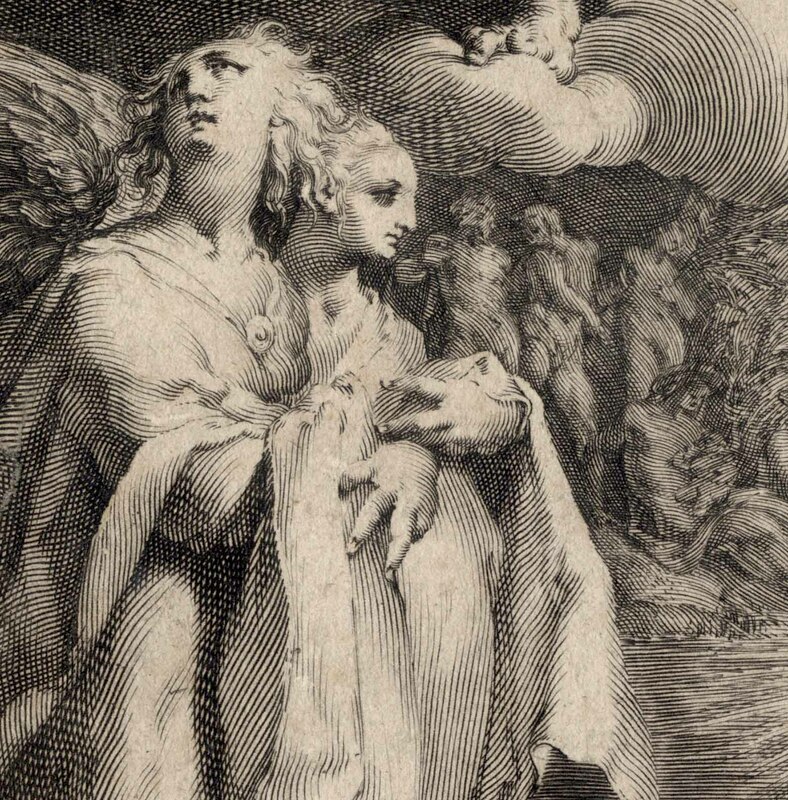 Inscribed within the image borderline in the lower-left corner: "JMuller fecit." Lettered with two lines of text in two columns below the image borderline: "Christe, Sator mundi ... abire lacu!" and lettered In lower-right corner: "Harman Muller excud:"
New Hollstein (Dutch & Flemish) 3.III (The Muller Dynasty [Jan Harmensz Muller]); Bartsch (1803) III.266.3; TIB (1980) 4 (3). 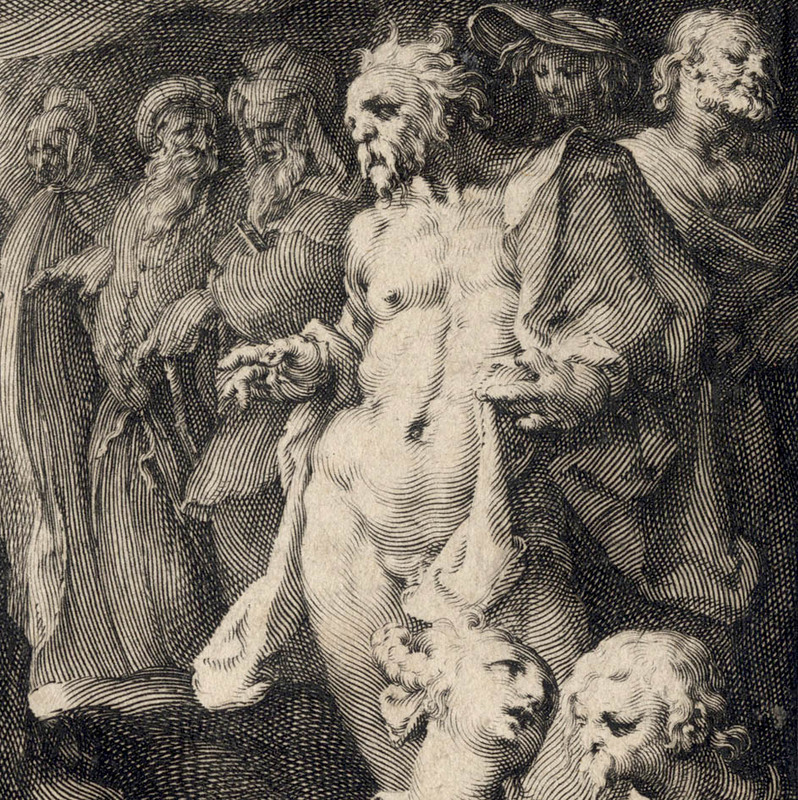 3 (266); see also: Bruce Davis 1988, “Mannerist Prints: International Style in the Sixteenth Century”, Edward Weisberger, ed. Los Angeles: Los Angeles County Museum of Art. Condition: crisp, richly inked and well-printed impression, trimmed to the image borderline with the text lines. The sheet is lightly age-toned and is glued to a support sheet of grey card. Apart from a 2mm spot stain on the upraised hand of the figure on the lower right edge and minor discolouration at the two lower corners, the sheet is in excellent condition. 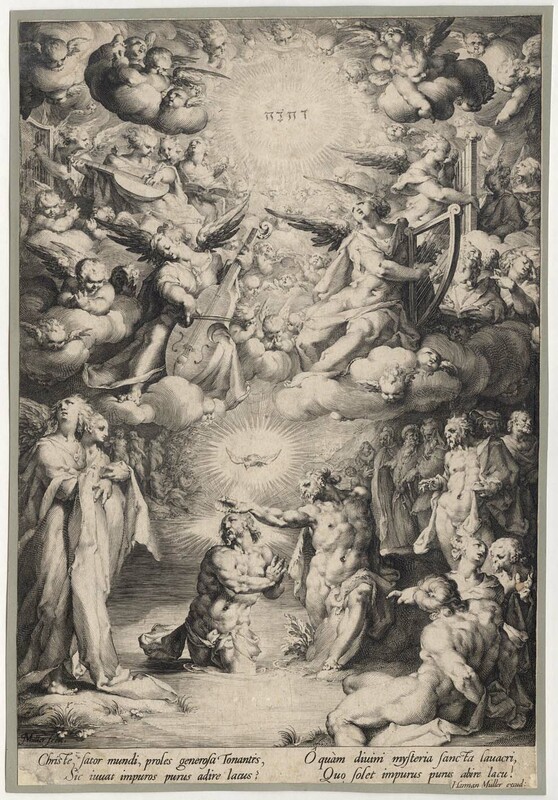 I am selling this magnificent engraving exemplifying the spirit of Mannerism and executed by one of the major old masters of the period for AU$493 (currently US$374.16/EUR352.30/GBP298.41 at the time of posting this listing) including postage and handling to anywhere in the world. If you are interested in purchasing this exceptionally rare and important print, please contact me (oz_jim@printsandprinciples.com) and I will send you a PayPal invoice to make the payment easy. 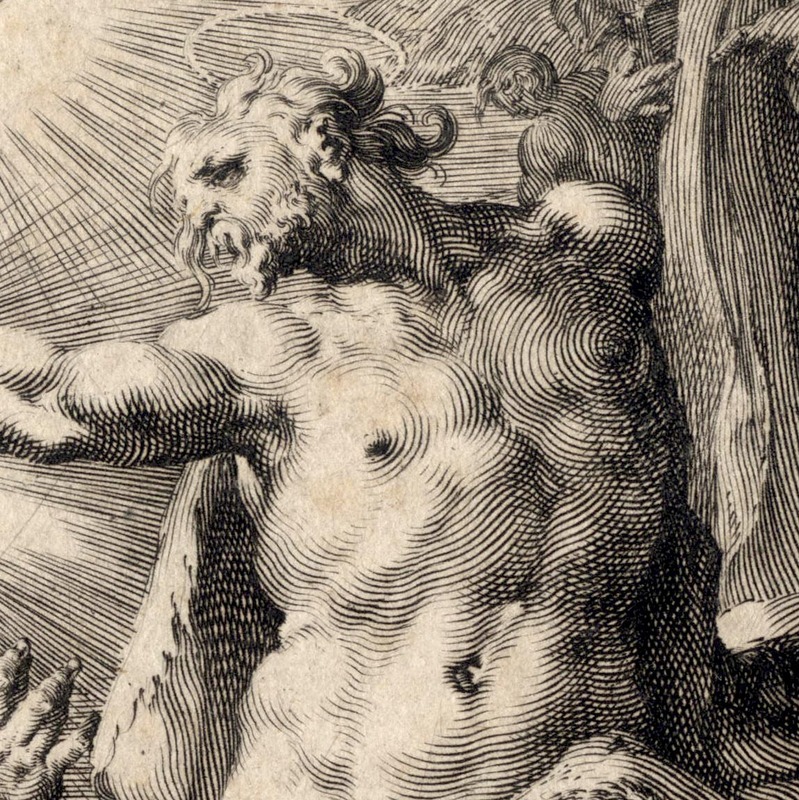 This is an important print. 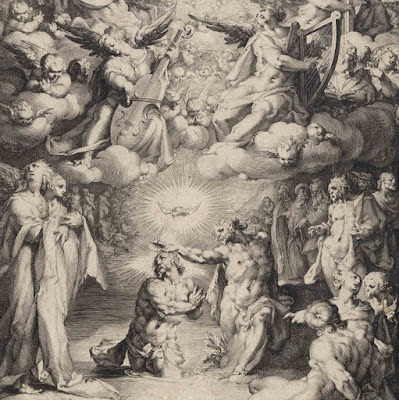 It is certainly important in terms of the portrayed subject’s religious significance: Jesus being baptised by St John the Baptist with the heavens opening to reveal the God’s name written in Hebrew. Beyond the subject, the engraving is an historical milestone in art embodying the spirit of late Mannerism when it was executed. 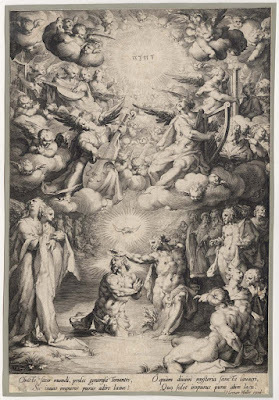 What I love about it on close examination is the theatrically expressive gestures where heads are thrown back in spiritual wonderment and hands become physiologically disconnected from the folk to whom they should be attached—see, for example, the two standing angels at the lower right whose hands don’t seem to fit with either figure. 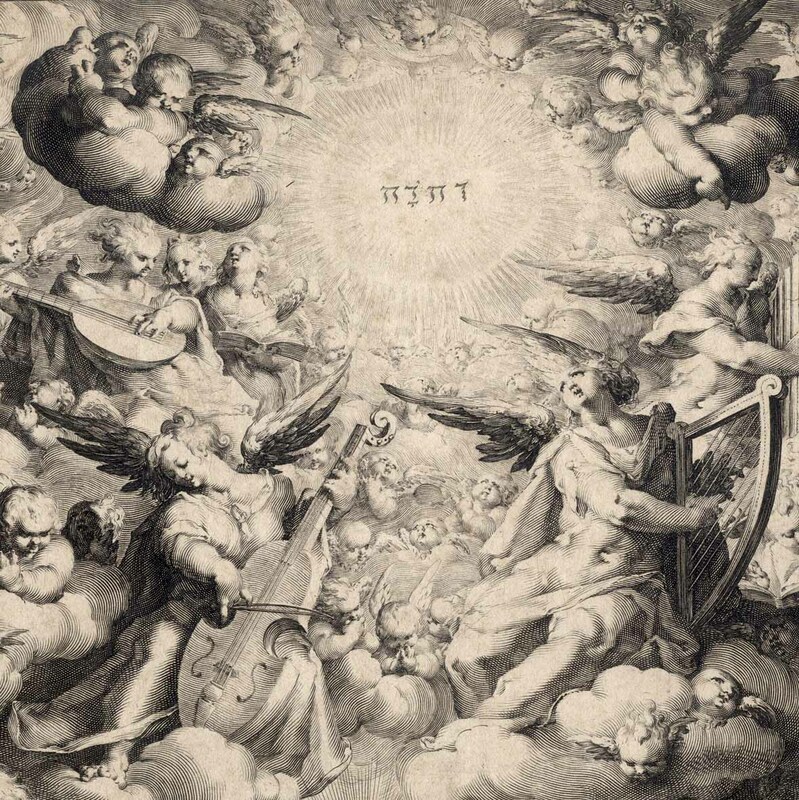 The importance of this print is also connected to the expression of sound connoted by instruments that the airborne angels play. I am more than a bit out of my depth to write sensibly about sixteenth century instruments, but I can see what seems to be an early form of today’s cello—perhaps it’s a bass viol?—played passionately by the closer angel at centre-left and what must be a type of lyre played by the closer angel on the centre-right (forgive me if I am completely wrong about my identification of these instruments). 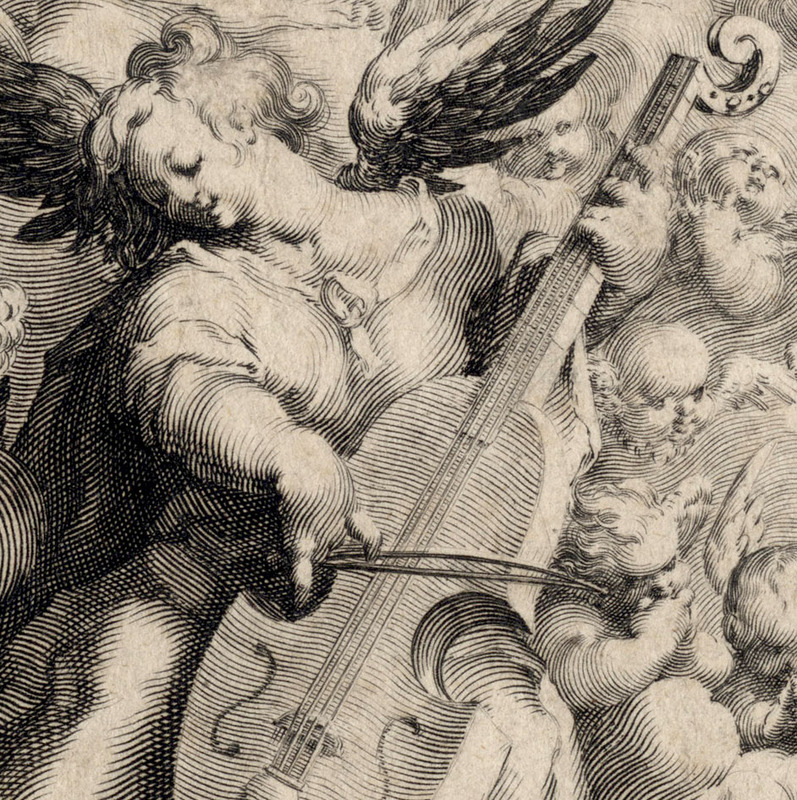 Images featuring angels playing musical instruments were not uncommon in the sixteenth century and I wonder to what extent that Muller could hear the sweet sounds produced by such instruments. 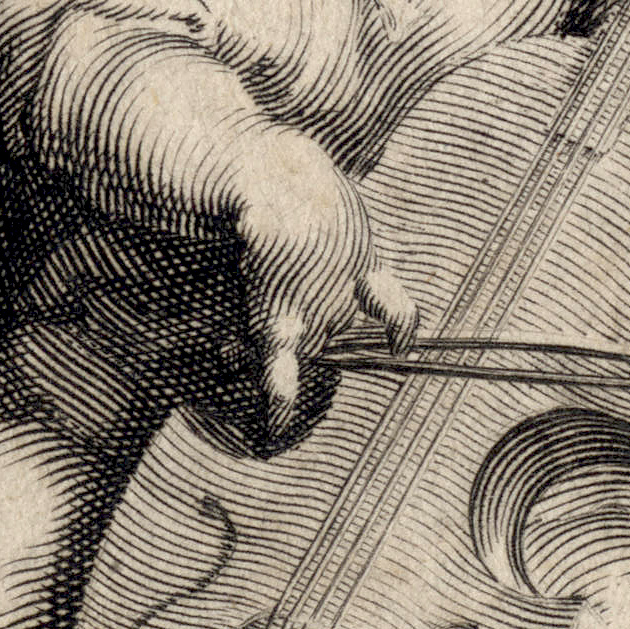 From a personal standpoint, I like the idea that he has kept to the same family of stringed instruments rather than portraying a broken consort (i.e. a mixture of string, wind and brass instruments) and I admire the way that Muller has organised the composition into intersecting conical shaped voids to take the music higher.